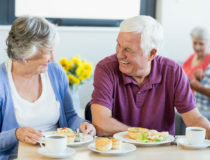 If you are searching for a senior living community for yourself, a spouse, or another family member, how much it will cost is likely a leading concern. There are many myths surrounding the cost of independent living and assisted living, including a persistent one that senior housing is only for the wealthy. Many people also believe that it is less expensive to age in place at home rather than move to an assisted living community because their house is mortgage free. They neglect to take in to consideration all of the additional expenses a senior incurs as they grow older: in-home care, housekeeping, lawn care, utilities, insurance, and more. So how much does assisted living cost and how do the costs stack up against staying at home? Here’s what seniors and their families should know before making a decision. 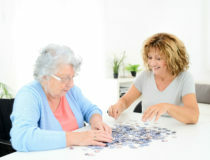 Assisted living can be an economically advantageous solution for seniors who need help maintaining their independence. It might be assistance to stay on track with their medication schedule or a helping hand with personal care. In 2016, the median cost for an assisted living community in this country was $3,628 per month. This is based on a one-bedroom assisted living apartment. In most assisted living communities, individual level of care charges are assessed separately. This means the senior and their family pay only for the care and support they need. A few examples of level of care services that you may be charged separately for each month include medication assistance, bathing, and dressing. Seniors and their families often ask how the cost of an assisted living community compares to the costs of aging in place at home. However, this can be a complicated question to answer. If a senior only needs a few hours of support each week, family members might be able to bridge the gap. A home care agency can also be employed to assist with tasks such as grocery shopping, housekeeping, personal care, and more. As the older adult’s needs increase and their care is more episodic (e.g., they need help getting to and from the bathroom in the middle of the night) home care expenses can quickly add up. The average rate for home care is $20 per hour with costs far higher in larger cities or major metropolitan areas. When you factor all of the costs involved in aging in place at home, it’s easy to see how a senior living community might be the most economical solution. We encourage you to visit Sonata Senior Living Financial Solutions Resources to explore a variety of funding solutions. From benefits for veterans to tax deductions, you can learn more about the options for financing senior living.